I may get sued to kingdom come for this post but hey, worth a punt and it made me laugh as I watched the most epic electrical storm ever (if you missed the midnight sky in Harrogate on 1 July you missed an awesome display of he powers of the gods - whoever you pray to)……so roll on the letters before action…. Today I will be talking (when not rambling) about Rogue Lifting, Brightening Eye Serum. So, in a slight reworking of the brilliant ‘Somebody to Love’ by Queen…. Can anybody find me, an eye cream to love? OK, so at £32 for a 10ml tube this immediately put me in frugal man mode. That seems expensive for not a lot of product so I had high hopes, assuming that if it costs a bomb for very little only a little would be needed and it would firm and lift the area around my eyes. So what do the company say about this rogue of an eye cream? Well in true and lazy fashion you can read it all here. So, onto application – after having a bit of a boozy (read slaughtered) weekend I have to say that at the start of the week I was looking peaky, a bit fatigued around the eyes and generally like I had been dead for a good few years. I was giving Skelator (for those old enough to remember the He-Man cartoons) a good run for his money in terms of looking rough. A few dabs of the serum under my eyes after showering and I was ready to go - well actually I went nowhere, I loitered around the mirror for a good half an hour to see if I could tell the difference…. At first there was a tingling sensation, the colouring of the area under my eyes had lightened considerably over the space of ten minutes and then within half an hour I could feel my eyes opening wider as the skin became tighter. Nice one, nice one…. An hour after applying and my eyes looked positively radiant - the skin was so tight even the fine lines had gone (for a good 8 hours), the colour resembled ‘alive’ and the bags had reduced in size by I would say, around 80%. You really can’t argue with that. Far from being a rogue this stuff is actually quite brilliant. Thankfully I got mine as a PR sample, I think the price would have originally put me off buying this, but, the results speak for themselves, this is a top notch eye lift serum. A little does go a very long way and it cranks up even my tired old eyes after a heavy weekend. Go on treat yourself or your other half. Looks like a great product. Greetings! So refreshing to get a mans perspective!!!!! Sent this link to my other half as he struggles to find recommended mens beauty products! Keep up the great work! That storm was awesome wasn't it. 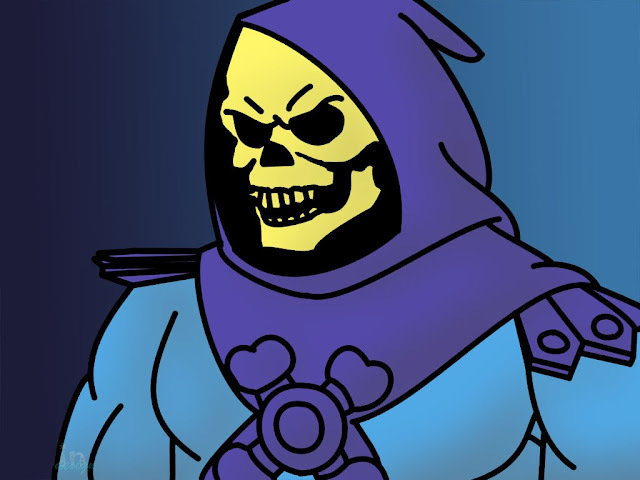 Gosh Skeletor haha! I think i might want to try this product for myself. Was wondering why you lookrd so refreshed lately so now I know your secret. Should have realised you hadn't stated to eat salad or anything healthy!